Below are the official 2017 Hockomock League Boys Hockey All Stars, selected by the coaches in the league. TAUNTON, Mass. – In a game with giant momentum swings, plenty of lead changes, and a dramatic finish, Taunton and Foxboro boys hockey finished level. Taunton scored with just 10.4 seconds left in the game, erasing Foxboro’s incredible third-period comeback to earn a point in a 5-5 tie. The Tigers led 1-0 after the first period but Foxboro stormed back for a pair of goals in the final two minutes of the second period to seize a 2-1 lead. But before the period could end, Taunton knotted the score at 2-2 with just seconds to play. Taunton capitalized on that late goal in the second by carrying the momentum into the third period, taking the lead just 31 seconds into the final frame, and making it 4-2 before a minute had elapsed in the third. Foxboro refused to go away though, cutting the deficit to one with just over nine minutes to play. And then the Warriors took advantage of a pair of power play opportunities, tying the game just over the midway point, and taking the lead just five seconds into its next man-advantage situation. With 1:39 to go, Taunton called a timeout after a Foxboro icing. Metea elected to keep sophomore Sean Bunker in the net for the time being, and the decision paid off. Foxboro’s Ronnie MacLellan, who had both of Foxboro’s power play goals, had a partial breakaway chance with just over a minute but Bunker (22 saves) denied the bid, keeping the deficit at one. Back up ice, Foxboro sophomore goalie Espn Reager was equal to the task when Will Walsh’s shot was tipped by Trevor Pietrzyk, but Reager made the save with his mask. The Warriors were whistled for a penalty out in front on the play, however, and with Bunker pulled, Taunton had a 6-on-4 chance. Walsh was the catalyst of the play, skating into the zone, weaving past a pair of defenders. He looped behind the goal before dropping the puck back to junior defenseman Andrew Carter, who quickly deposited a shot on goal. Reager blocked down the original bid through traffic but Pietrzyk was in the right spot for the rebound, netting the tying goal with just 10.4 seconds to go. It looked as though Taunton was going to skate away with a win with three goals in the time span of a minute of game play. Pietrzyk set up Jakob Roberts right in front of the net to steal the momentum at the end of the second. Walsh quickly gave Taunton its second lead of the game with a wrist shot just inside the zone just 29 seconds in. The Tigers continued to put their foot down on the gas pedal as Roberts potted a rebound chance when Pietrzyk had his close bid denied by Reager. But trailing 4-2 just a minute into the third period didn’t phase the Warriors. Senior defenseman Aidan Sullivan stepped into a slap shot and found the back of the net with 9:06 to play to make it a one-goal game. On the power play, junior Brendan Tully drew the attention of the Tigers’ defense before rifling a pass right in front to MacLellan for a one-timer, and a 4-4 tie. Foxboro went on the man advantage with 4:48 to play, and after winning the face-off, MacLellan gave the Warriors the lead just five seconds into the power play. Walsh gave the Tigers the lead in the first period, taking a perfect one-time pass from Pietrzyk in stride into the attacking zone and finding the back of the net with a wrist shot. Tully tied the game for Foxboro with 1:25 left in the second period. The junior defenseman jumped on a loose puck in the neutral zone, took a couple of strides into the attacking zone and unleashed a wicked wrister to make it 1-1. Just 40 seconds later, MacLellan avoided a defenseman with a nifty spin move, dishing the puck to Sebastian Ricketts all in one move, and the sophomore buried it for a brief 2-1 lead. Roberts tied the game up just 35 seconds later for Taunton. Taunton boys hockey (0-1-1 Hockomock, 4-3-1 overall) is back in action on Saturday when it hosts Mansfield at 2:00. 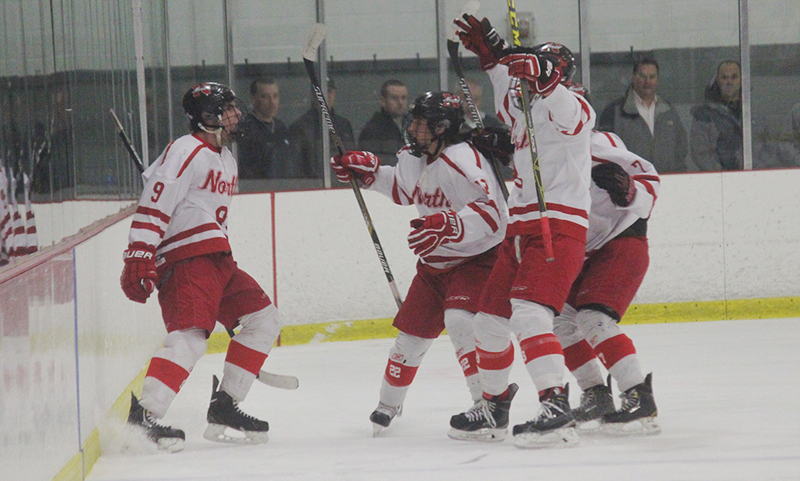 Foxboro boys hockey (0-0-2, 3-2-2) will hit the ice again on Wednesday when they travel to face Mansfield at 5:40. The Black Knights are a relatively young team this year, so they will be relying heavily on their experienced players to lead the way and make a difference. Senior Brendan Campbell was one of three players to go over the 20-point plateau last season, and just one of two returning this season along with junior Sean Doherty. Campbell was second on the team with 11 goals and notched a team-high 15 assists for a team-best 26 points. Campbell is one of the fastest skaters in the league, which gives him an edge on defensemen. Once he gets the puck on his stick, he’s a threat to make a big play. Whether it be setting up a teammate for a great opportunity, or putting it on goal himself. He is someone opposing teams will need to focus on this again season. Two years removed from being selected for the HockomockSports.com Third Team and All-Underclassman Team, King Philip senior Collin Cooke remains one of the most dynamic forwards for the Warriors and someone capable of helping KP climb up the league standings. Last year, Cooke scored 10 goals and recorded seven assists and was tied for second on the team with 17 points. His speed and his ability to beat defensemen in the attacking zone opens up space for his teammates and he is capable of picking the right pass to ensure a scoring opportunity for the Warriors. Cooke will be one of the key players for KP, if the Warriors are going to book a spot in the state tournament. Quinn Gibbs had big shoes to fill when he stepped between the pipes last season, trying to fill the void left by a three-year starter. But Gibbs held his own, and quickly made a name for himself around the league as a top goalie. During his first year in net, he made 320 saves (0.924 save percentage) while allowing just 1.31 goals against a game. As the year went on, you could see his confidence grow. He will be a vital part of the Bulldogs’ defense this year after losing a handful of starters to graduation. He already has a good amount of playoff experience as well, which will be key as Canton will likely be a contender in D2 South again this season. Mansfield senior defenseman Tyler Oakley will be the leader of the Hornets defensive effort this season and will set the tone with his physicality and ability to pick the right pass to spring the forwards into the attack. Oakley was a HockomockSports.com Second Team performer in 2016-17 after anchoring a defense that allowed only 50 goals on the season, which was second best in the Kelley-Rex division and fourth best in the league. He also recorded 10 assists from the blue line and recorded a team-high plus-18 for the season. With Oakley back as a top-four defenseman, Mansfield will be hoping to improve on last year’s third-place finish in the division. Franklin senior forward Brendan O’Rielly will be hoping to lead the Panthers on a run similar to his sophomore season when they won the Div. 1 state title. O’Rielly was the team’s leading scorer last year with a team-best 20 goals plus 11 assists for 31 points. He will spearhead an experience group of forwards and will use his strong skating, good stick-handling, and accurate shooting to help Franklin make another run at a Kelley-Rex division title. As a three-year varsity player, O’Rielly has continued to develop throughout his career and has the potential to be one of the league’s leading scorers again this winter. Attleboro senior forward Jake Parker returns to lead the Bombardiers attack this winter and, as usual, will be counted on to not only create scoring opportunities for himself and his teammates but also to chip in on the power play and penalty kill. An unselfish forward with a keen eye for a pass, Parker is always the first look for an Attleboro defenseman to try and break the puck out of the zone with speed. With great stick-handling ability, Parker can get Attleboro set up in the offensive zone and gives the Bombardiers much-needed patience on the puck. 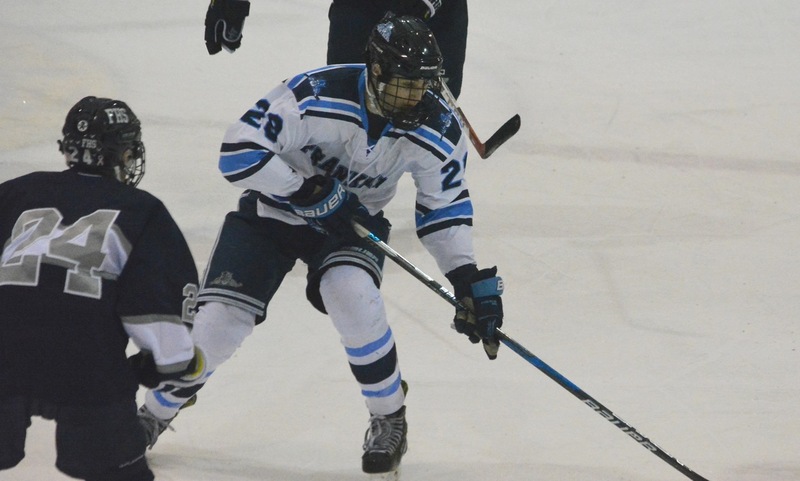 Parker, who was on the HockomockSports.com Second Team last year, scored 20 goals and had six assists in 2016-17, including a five-goal performance in a tie with Mansfield. Foxboro has been able to rely on Aidan Sullivan for the past three years and will look to him for leadership both on and off of the ice this season. Sullivan enters his fourth year as a member of the Warriors’ defensive unit and has improved every single year. 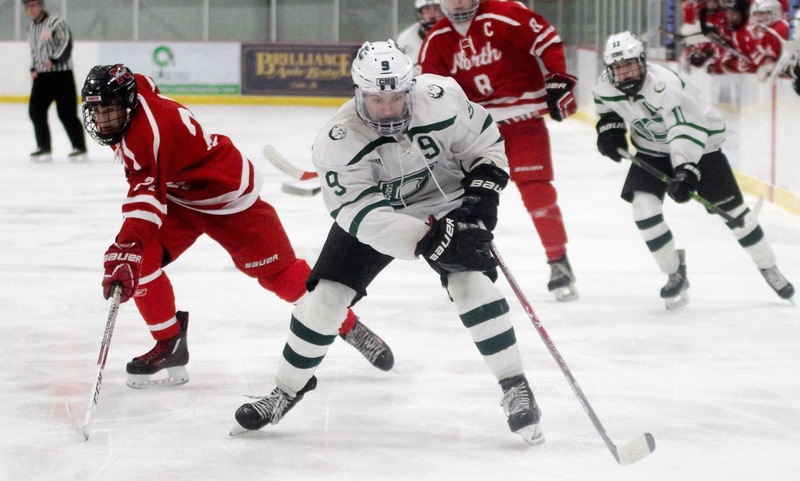 He was named to the 2015-2016 HockomockSports.com All Underclassman Team as a sophomore and improved his production on the offensive end of the ice last season notching a career-high eight points, scoring twice with six helpers. Foxboro has a relatively young group of forwards this season so it will be important for Sullivan to be an anchor on the defensive end as the younger players gain experience. After a season away with a juniors team, Taunton senior forward Will Walsh has returned to provide a boost to the Tigers attack. Walsh is a dangerous scorer with an accurate shot and a lot of energy that is contagious. His teammates feed off the emotion and energy that he plays with. Two years ago, as part of a powerful Taunton offense, Walsh scored three goals and 11 assists. In 21 games with the South Shore Kings in 2016-17, Walsh scored two goals and seven assists and his addition will open space for his fellow forwards and add to the potent Tigers attack. North Attleboro’s Ryan Warren has been one of the most consistent goalies in the league over the past two seasons. He was stellar during his freshman season and earned HockomockSports.com Underclassman of the Year honors, and last year during his sophomore campaign he helped Big Red to 14 wins by making 395 saves and a .892 save percentage. From his first year on varsity, Warren has always shown great positioning, and his ability to control rebounds makes it difficult for opponents to net second chance goals. Oliver Ames had a handful of young talented forwards last season, and Brett Williams emerged as one of the most talented in the league. Williams helped the Tigers have a terrific season, coming within one point of the Kelley-Rex division title. As just a sophomore, he scored a team-high 12 goals while adding eight assists for 20 points. His speed is what really sets him apart from others in the league. His quick burst allows him to get get pass defenses and fly in on goal, and on top of his speed, he has the ability to finish. King Philip junior Nicole Connor is one of the most versatile girls’ hockey players in the newly formed Hockomock league and will be a key to KP making a run at the inaugural league title. Connor will see time as both a forward and on the blue line, giving the Warriors help all over the ice. As a sophomore, Connor scored five goals and had six assists while playing primarily as in defense and she is poised to have a breakout winter for the Warriors. 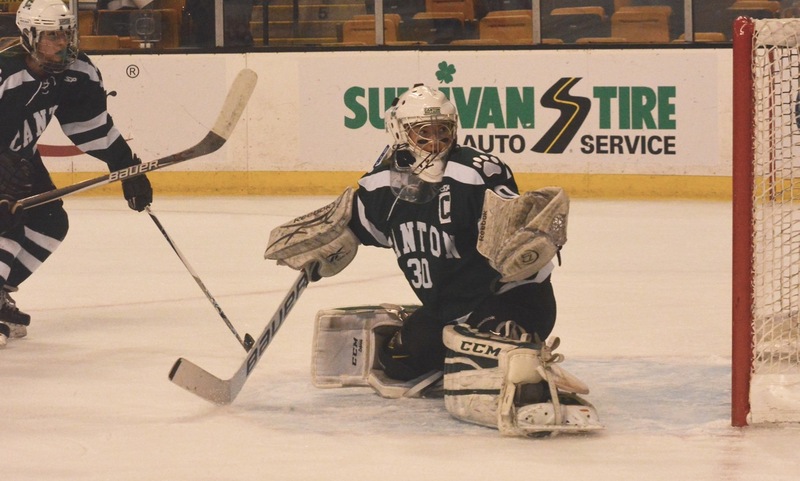 Canton senior goalie Colleen Kelleher returns after a strong season in net for Canton, leading the Bulldogs from the No. 14 seed to their first state final since 2006. Kelleher came through numerous times in the playoffs to keep opponents out and give the potent Canton attack the chance to find winning goals. She will backstop Canton’s attempt at winning the inaugural Hockomock League title. Foxboro senior forward Catherine Luciano has been one of the most dynamic scorers in the area over the last two years and led the Warriors in scoring last winter with 25 goals and 12 assists. Luciano is off to a flying start this winter with a hat trick in the season-opening win against Dover-Sherborn/Hopkinton. The partnership of Luciano with Mackenzie Fraser (19 points last year) and Isabelle Shanteller (21 points) could be the key to Mansfield/Oliver Ames making a run at the first ever league title. 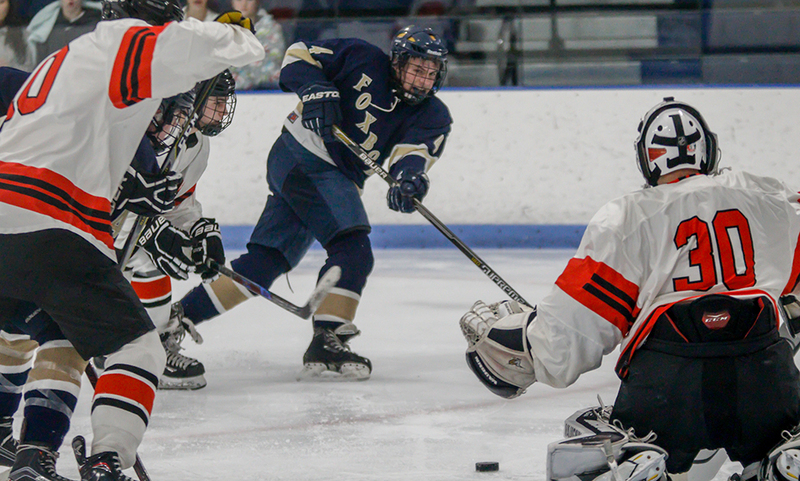 Franklin junior Regan Paterson will be one of the primary attackers for Franklin, as the Panthers compete for the first ever Hockomock League title and book a return to the state tournament. Paterson score 11 goals and had five assists as a sophomore and is coming off a strong fall for the Franklin field hockey program. Her experience will be counted on to lead a young Panthers roster this winter. Stoughton senior defenseman Julia Russell is coming off a pair of all-star seasons for the new program and will be hoping to take her form from the SEMGHL to the Black Knights opening campaign in the Hockomock League. Russell is a speedy defender who can also step into the attack and her leadership will be key for a talented group of underclassmen that have Stoughton confident in a big improvement this winter, as evidenced by a season-opening win over Framingham. Click here for the 2016 HockomockSports.com Hockey Awards.